The leaves are falling, the days are getting shorter, and the clouds are rolling in. To get a good scare, you may find yourself reaching for a creepy classic on your movie shelf. But the frightful fun of fall goes far beyond Halloween. Celebrate in a new way this year by skipping that horror movie you’ve already seen and instead go visit a real life haunted place! Take your pick of all or one of these authentically haunted tours. No costumes, no scripts, just pure creepiness. Whether you’re looking to stay at a hotel haunted by its former tenants, participate in a real paranormal investigation, or get a historic tour of an underground prison, these 3 haunted spots are guaranteed to give you goosebumps this Halloween season! Here’s Johnny! This creepy hotel inspired Stephen King’s famous novel and movie “The Shining”. Guests and employees have reported countless eerie encounters with the other side, and even Stephen King himself had haunting dreams while staying there! 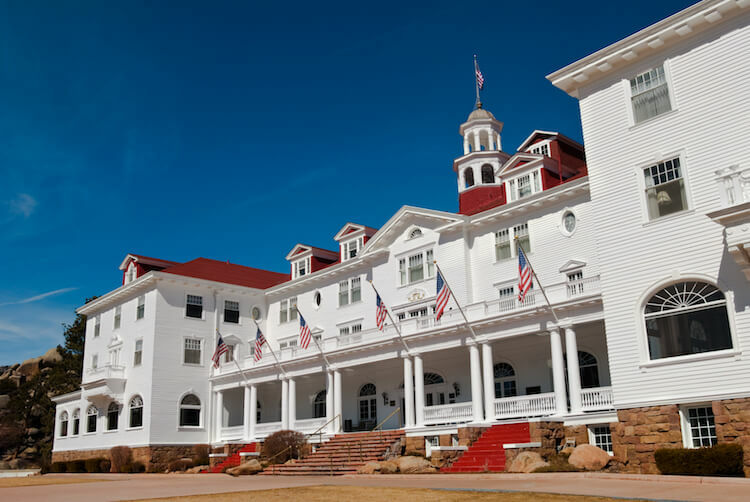 The hotel was first opened in 1909 as a secluded mountain getaway by F.O and Flora Stanley. It’s said that the ghost of F.O Stanley has been reported to be standing behind reception desk employees, and the spirit of his wife Flora occasionally plays piano in the music room. The creepiness doesn’t stop there. Almost every room has had reports of inexplicable occurrences. Room 418, for example, is said to be haunted by mischievous children who play pranks like removing the covers from people at night, flickering bathroom lights, and moving hangers. The concert hall also has a couple ghostly regulars. Jack-of-all trades Paul was once the go-to-guy for countless hotel tasks, including enforcing the concert hall curfew. He died of a heart attack in 2005 and is said to be heard yelling “get out” if people stay there during late hours. The ghost they call Lucy also spends time in the concert hall. Lucy was said to be a homeless girl caught squatting in the basement. When she was sent away, she tragically froze to death. Now, she’s occasionally heard humming in the hall. Want to try and meet these spirits for yourself? Try the hotel’s Night Spirit Tour. This 75-minute tour takes you through the hotel’s hot spots for spiritual activity and teaches you how to interact with it. Book a “spirited room” at the hotel for afterwards to get an extra creepy experience. To get there, simply take a quick, cozy flight to the Boulder Municipal Airport and arrive in style by renting a limo to take you on a beautiful hour-long ride into the mountains. When you’re not ghost hunting, enjoy the beautiful town of Estes Park. Stroll through the downtown area’s charming souvenir shops, take a ride on a giant mountainside slide, or check out the beautiful fall scenery of Rocky Mountain National Park. Shanghaiing was the act of kidnapping men to sell as slaves to work on ships. In Portland, human traffickers were said to have lured men into local saloons fitted with trap doors leading to caves under the city. There the unsuspecting men would be drugged and imprisoned before being sent to the coast to be sold. Needless to say, the tunnels have an odd energy about them, and are said to be haunted by the tormented men who died in them. The Shanghai Tunnels Tour begins above ground, where you learn the history of 19th century Portland and what led to the creation of these terrifying underground prisons. From there, you’ll descend into the Portland underground where you’ll see holding cells, trapdoors, unearthed artifacts and more. Land directly in Portland via the private and convenient Hillsboro Airport. From there, you can take a private car or light rail to the trolley line which will drop you off right at the tour in Chinatown. If you’re looking for more heebie-jeebies in Portland, check out FrightTown. It’s a series of 3 staged haunted houses. Each one gets scarier as you go, so it’s up to you if you can handle the third. Feeling the need to decompress instead? Take a relaxing stroll through Cooper Mountain Nature Park or the Classical Chinese Garden located downtown. Catalina has a haunting history that contributes to the creepy feelings and sightings that many have reported. The beautiful island was originally occupied by the Gabrielino Indians, who were slaughtered by Russians when the tribe tried to prevent the Russians from poaching sea otters for their pelts. Later, in 1592, a Spanish explorer named Juan Cabrillo arrived and claimed the island. From there, many criminals followed. Smugglers would often fight amongst themselves resulting in a high death toll. A gold rush added even more deaths to the count when caves collapsed on gold miners who tunneled under the seabed. The ghosts of Native Americans, crooks, gold miners, and other Catalina citizens roam the island and seem to grow in numbers as time moves on. Try out the Catalina Ghost Tours for a refreshing spin on haunted tours. Your tour guides are more than they appear— they’re trained paranormal investigators taking you on their mission to contact the spirits around Avalon, a village on the island. No two tours are alike, as they let the energies guide the tour. Catch a private flight to Catalina’s Airport In The Sky, a private airport right by the village of Avalon that occupies an entire mountaintop. From there, hop on the Wildlands Express shuttle directly to Avalon and let the haunted experience begin! Spruce up your fall island vacation by stopping by one of their many fall festivals like the Lobsterfest and Oktoberfest that run through the entire month of October. Here, you can enjoy not only a selection of delicious Paulaner beers, but delectable dishes made from fresh-caught lobster. Be sure to schedule some extra time on your way back to the Airport In The Sky to enjoy one of their mountaintop tours.